The seventies was the golden age for Made For TV movies. Cable and home video were still in their infancy and wouldn’t make much of an impact until the end of the decade. So if audiences wanted to watch movies on TV, they generally watched the (insert name of network and day of the week here) Night Movie. Often these would be Hollywood films edited for television, but with studios not as quick to turn their hits over to TV back then as they are now, you also had a fair number of original feature films made by or for the networks. One of the biggest producers of made for TV movies was Dan Curtis. Curtis got his start with the gothic horror soap opera ‘Dark Shadows’ before moving on to TV features. Although he eventually produced such prestige programs as ‘The Winds of War’, his specialty remained horror. His best known TV movies in the genre include THE NIGHT STALKER and TRILOGY OF TERROR, but he made several others, including this interesting thriller. An ‘ABC Movie of the Week’, SCREAM OF THE WOLF at first seems like it could have been another NIGHT STALKER entry. One is tempted to imagine if Richard Matheson had replaced Peter Graves’ “great white hunter turned writer” protagonist with his better-known creation, crusty reporter Carl Kolchak. But as it turns out, Matheson has something very different in mind than first appears, something that wouldn’t have worked as well with Kolchak. The set-up is that a wolf has been killing people, and local Sheriff Vernon Bell (Philip Carey) turns to retired hunter John Wetherby (Peter Graves) for advice. Wetherby examines the crime scene, and is surprised to find the wolf tracks seem to vanish, only to be replaced by human footprints. You can see where the more imaginative mind might go based on that, but the grounded Wetherby isn’t prepared to say “werewolf” just yet. Instead, Wetherby calls on his old friend Byron Douglas (Clint Walker), hoping he’ll help him track down the killer animal. Somewhat to his surprise, Byron refuses. In fact, he thinks the killings are actually good for the populace, getting them more in touch with their primal selves. He believes the victims never felt more alive than when they were facing down the beast that killed them. Understandably, Wetherby’s lady friend Sandy Miller (Jo Ann Pflug) thinks Byron is not only kind of a jerk, but probably should be a suspect. But Wetherby isn’t prepared to go there, either. Sure, the guy’s eccentric, but he couldn’t possibly be a cold-blooded killer, let alone a werewolf. Could he? Let’s just say you don’t have to be Sherlock Holmes to solve this case. However, there is a bit of a twist that might take you by surprise. And regardless, this is just a fun time waster (and time capsule) of a film. Everyone has that serious yet slightly over the top acting style that epitomized TV acting of the era, and would serve Graves in good stead in AIRPLANE!. This being a TV movie, we don’t see a great deal of carnage. Usually just the beginnings of attacks from the wolf’s pov with the victims in terror before cutting away. The score by Bob Cobert helps is the same sort of funky jazz he used in his compositions for THE NIGHT STALKER and its sequel, THE NIGHT STRANGLER, and may very well have just been recycle from those films for all I know. Regardless, it helps amp up the tension and, from the perspective of today, adds another layer of seventies nostalgia to the proceedings. Highlights include a manly handshake between Graves and Walker that, while not as iconic as the Carl Weathers/Arnold Schwarzenegger clasp in PREDATOR, similarly serves to establish the testosterone levels of the two leads. There’s also a fun scene where Walker gets to go completely over the top intimidating an “enlightened” male who criticizes his philosophy. 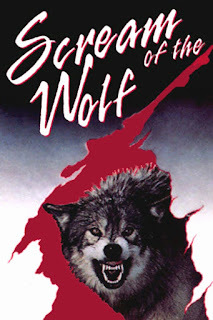 SCREAM OF THE WOLF is by no means the best collaboration between producer/director Curtis and writer Matheson, but it’s still a reasonably entertaining if seriously dated (“nostalgic”) effort. Too bad the print Amazon Prime had available to stream was less than stellar, but it wasn’t so bad I had to turn it off.